One of the first steps to building a solid financial plan is to accumulate a cash reserve. Popular financial planning rules of thumb suggest keeping 3-6 months of living expenses in cash. Homeowners and those in jobs subject to layoffs may prefer to keep a year or more in cash reserve. 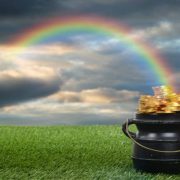 A cash reserve is a rainy-day fund that should not be invested in stocks or bonds. The purpose of a cash reserve is to pay for large, unexpected expenses such as; home repairs, car repairs, insurance deductibles, or paying bills during a period of unemployment. If you’re planning to buy a home or car in the next few years, you might also be keeping large amounts in a savings account. Since cash savings is likely to be a larger percentage of total net worth for younger investors, it’s important to compare interest rates regularly. Now that interest rates are more than 0.00%(! ), interest rate shopping is important. First, make sure you’re getting the highest rate offered at your bank or credit union. Banks are constantly offering promotional rates for new accounts, meaning you may need to open a new account or transfer money to a different account to get the highest rate. Don’t let your savings sit in an account getting a lower rate. If you find a higher rate advertised elsewhere, there’s a chance your primary bank or credit union will match it. It might be worth a trip inside a bank branch to inquire about your options. Many banks are willing to work with you to maintain your deposits. *Savings account rates found on Bankrate.com on December 12, 2017. This information is presented for informational purposes only and does not constitute a recommendation. Keep in mind that short-term interest rates are slowly rising. The Federal Reserve is forecasting three rate hikes in 2018. That means the interest rate on your savings account is likely to change next year. Rather than constantly chasing the highest rate, set reminders to check your rates once or twice each year. Saving is hard, so make sure you’re earning a good rate on your cash reserves. You deserve it. Global vs. International – In the mumbo jumbo of investment nomenclature, Global funds have U.S. and International holdings, while International funds have no U.S. holdings. 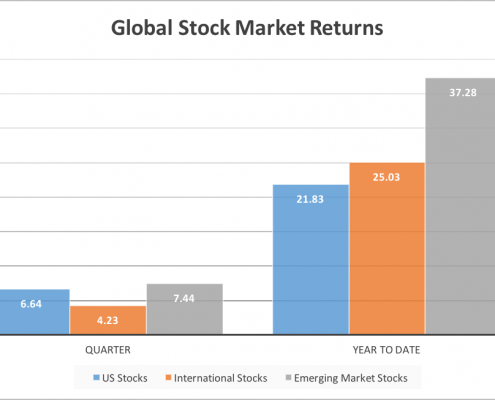 I think the ambiguous terms lead a lot of investors to believe they have more exposure to international stocks or bonds than they actually have. There are 822 mutual funds in the World Stock category with the word “Global” in the title. These funds have on average 48% invested in U.S. stocks. High-Yield – After the junk bond crisis in the 1980’s, risky bonds with low credit ratings were rebranded as “High-Yield”. Who doesn’t want a high-yielding bond fund? When I see high-yield bond funds in 401(k) lineups, I cringe to think that participants are selecting the fund without understanding they are investing in risky bonds. As recently as December 2015, the Third Avenue Focused Credit Fund (no mention of high-yield or junk bonds in this name) failed to meet investor requests for distributions and collapsed. I think the term high-yield should be banned, but until that happens, remember that High-Yield = High Risk. Growth / Aggressive Growth / Capital Appreciation – Everyone wants growth in their portfolio. That’s why this term, that refers to a style of stock investing focused on earnings growth is misleading. Growth-style investing has long periods of both outperforming and underperforming the market. The burst of the dot-com bubble is an example of a long period of underperformance for Growth stocks. Some funds amp up their name by adding “Aggressive” to the title. And then there is my all-time favorite term, “Capital Appreciation.” I don’t think it means “admiration for uppercase letters”, and it does nothing to clarify the type of investments in a fund. Equity Income – On the other hand, everyone wants income in their portfolio, too. This term is used to describe funds that invest in dividend paying stocks and/or certain bond investments. Usually funds with this moniker fall into Value-style investing, but not always. We eschewed the terms “equity” and “fixed income” in our client reports several years ago in favor of using “stocks” and “bonds”. Total Return – Total return is a popular name for bond funds. Most of these strategies invest in a diversified mix of government bonds, agency mortgages, corporate bonds, commercial mortgage-backed securities, and asset-backed securities. PIMCO Total Return was once the world’s largest bond fund, with more than $300 Billion in assets. There are 315 funds bearing the moniker Total Return today. They include funds that invest in intermediate bonds, balanced allocation funds, large cap value stocks, world bonds, and alternative strategies. Total return is a term that indicates yield + price appreciation, and is applied to stock investment strategies as well. Over the years, I’ve seen a lot of interesting mutual fund names. One of my favorites is the James Balanced: Golden Rainbow Fund. 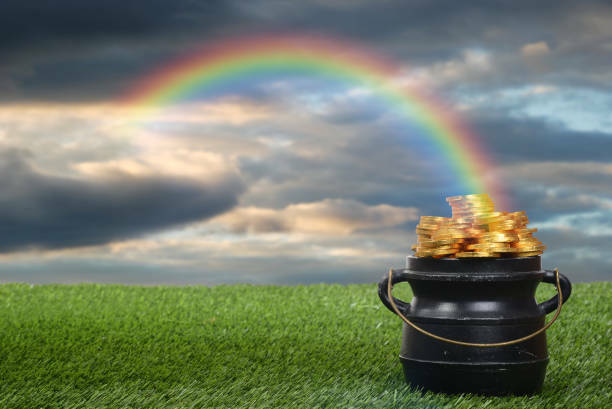 According to the fact sheet, the Golden Rainbow fund “seeks to provide total return through a combination of growth and income and preservation of capital in declining markets.” I like rainbows, and I like to visualize the gold, guarded by a leprechaun, at the end of the rainbow. Honestly, I’m a bit disappointed that this name is taken in case I ever manage a mutual fund. Warning! 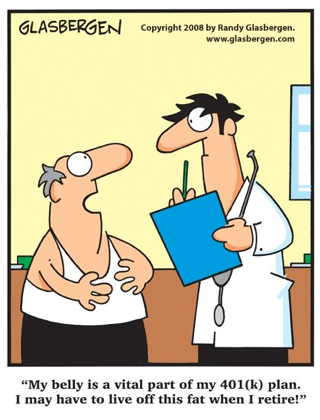 Too much information is bad for your financial health. Unfortunately, we’re living in a world where information is travelling faster than light speed. News organizations are competing for your clicks and your eyeballs every millisecond of the day. Information is coming at you from every direction; your television, your radio, your cell phone, and through your friends’ social media shares. It takes effort to avoid information these days. This information is hard to digest, let alone make sense of it all. Extreme advice, but I would love to see the reaction of someone who actually did that. 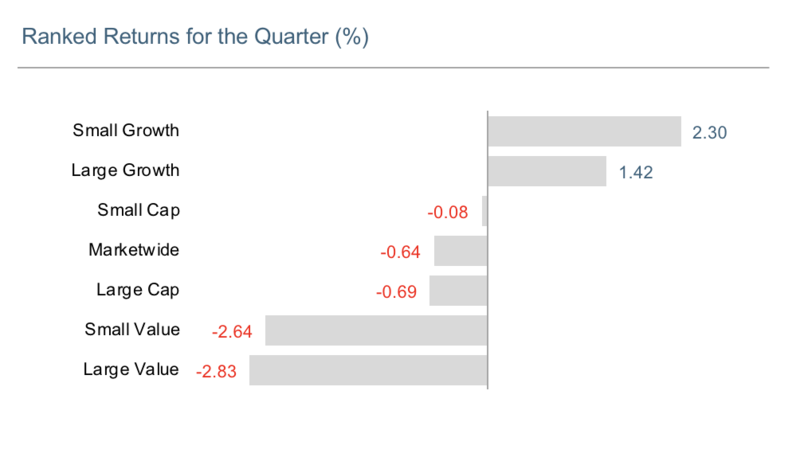 Stocks around the world edged higher during the second quarter. 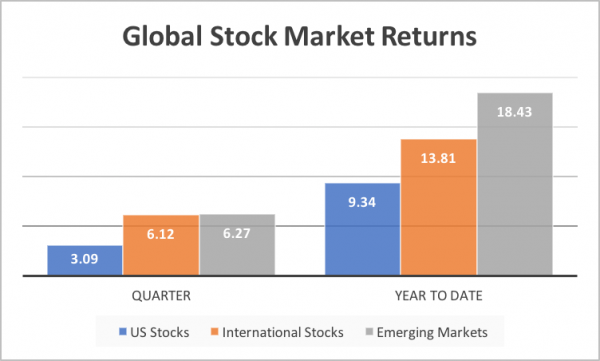 International and emerging market stocks continued to outperform U.S. stocks, while growth stocks outperformed value stocks. 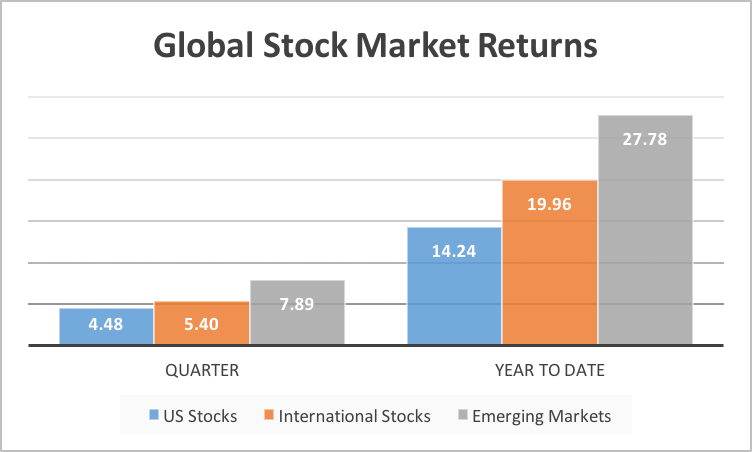 In the U.S., large cap stocks performed better the small cap stocks, but the reverse was true in international developed markets. Domestic bonds had small positive returns year to date, as short term interest rates ticked higher. 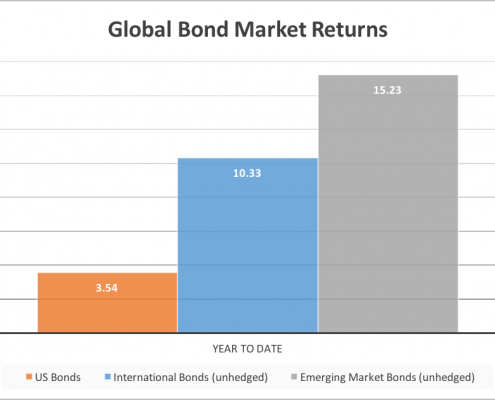 International bonds, particularly in emerging markets, performed better than domestic bonds as the dollar experienced some weakness against global currencies. Volatility remained conspicuously absent, with the VIX index (a key measure of near-term volatility conveyed by S&P 500 stock index option prices) trading near all-time lows. Oil pulled back into the mid $40s as the OPEC production cuts encouraged a boost in U.S. shale production. US Stocks are represented by the S&P500 Index. International Stocks are represented by the MSCI EAFE NR Index. Emerging Markets are represented by the MSCI Emerging Markets Index. On June 14th, the Federal Reserve increased interest rates for the second time this year. Now the Fed Funds rate stands at 1.00% – 1.25%. While short term interest rates have risen, longer-term rates declined year to date. This caused a flattening of the yield curve. Historically, a yield curve inversion (which occurs when short-term rates are higher than long-term rates) has been associated with economic recession. Investors should keep a close eye on the interest rate curve. 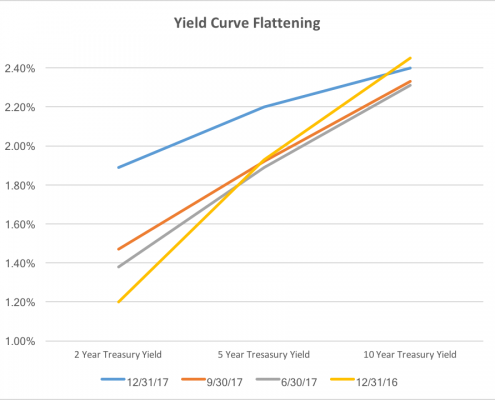 The good news for bond investors, however, is that the reduction in long-term rates caused bond prices to rise, while the increase in short-term rates provides better yield opportunities for reinvestment. The Bloomberg Barclays US Aggregate Bond Index is up 2.27% year to date. 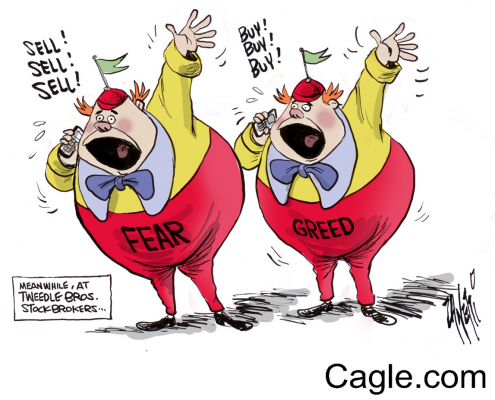 There’s a misperception that stock prices always fall when interest rates rise. After all, the purpose of tightening monetary policy is the slow economic activity, right? 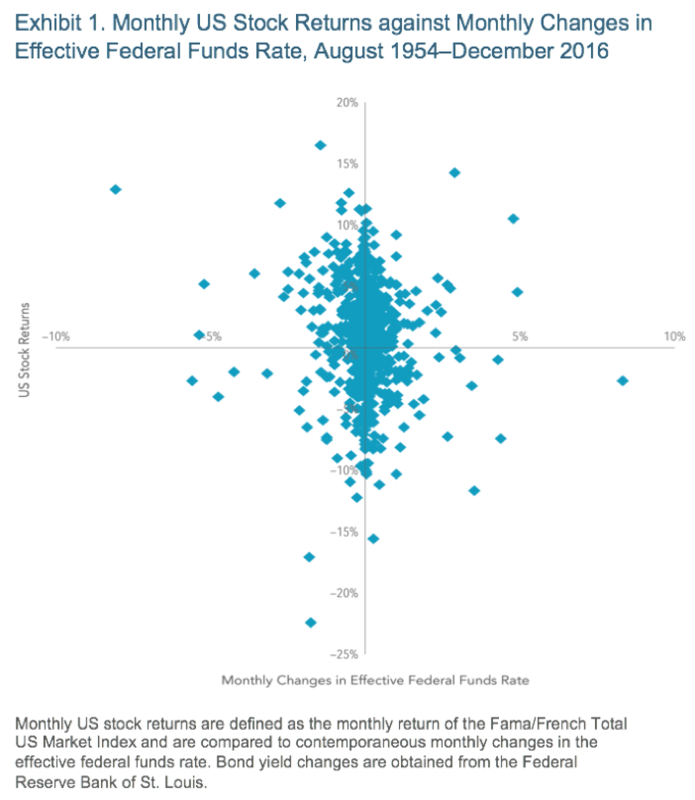 A look at historic data shows no correlation between changes in the Federal Funds rate and stock returns. Below is a graph of the historic data. If there were a correlation between Fed Fund changes and US stock returns, we would see the dots form an upward sloping line to the left. Instead, we see no pattern. After the 2008-2009 financial crisis, the Fed embarked on three rounds of bond purchases called Quantitative Easing (QE 1, 2, and 3). These purchases increased the Fed’s balance sheet from about $1.5 Trillion to $4.5 Trillion. In 2014, the Fed began “tapering” bond purchases but continued to reinvest interest and maturing bonds, keeping the balance sheet level around $4.5 Trillion. This fall (consensus expectation is September) the Fed will stop reinvesting all proceeds and will allow balance sheet assets to roll off, starting at $10 Billion per month. This will be a crucial time for financial markets because other buyers will need to purchase bonds in place of the central bank. The most likely outcome will be a rise in long-term interest rates. The central banks of Japan and Europe will watch closely, as they embarked on similar quantitative easing policies years after the Fed. After all the criticism thrown at the Fed’s unprecedented policies after 2008-2009, we may be about to find out if the exit will be successful. In late June, I participated in a panel at the IMN Global Indexing and ETF Conference in Dana Point, CA. The panel topic was ESG (Environmental, Social, and Governmental) investing. The other panelists and the moderator all represented institutional investors, and it occurred to me that individual investors are behind the curve in this topic area. Fifteen years ago, this type of investing was called Socially Responsible Investing (SRI). It consisted of negative screens for the so-called “sin” stocks and bad apples; think tobacco, firearms, and fossil fuels. SRI investors were willing to sacrifice return in order to align their investments with their values. ESG investing is different. ESG focuses on risk management and potential alpha from investing in companies who are leaders in a variety of Environmental, Social, and Governance factors. Environmental is not a blanket rejection of oil producers but a screen to identify those with the best practices for sustainability. Social includes screens for proper use of human capital such as fair compensation, sick leave, paid family leave, and the avoidance of child labor in emerging markets. Governance refers to board structure, composition, and independence. There’s a growing body of research that suggests ESG factors might even be sources of outperformance for investors and at least are not performance detractors. I think investors will see a lot more attention paid to this topic over the next decade, and I am excited to see new developments in the ESG space. Jason Zweig, author and personal finance columnist for the Wall Street Journal, famously said; “My job is to write the exact same thing between 50 and 100 times a year in such a way that neither my editors nor my readers will ever think I am repeating myself.” This is how I feel about the conclusion of each quarterly letter. I try to end each letter with common sense investing principles explained in a new way. We spend a lot of time talking about risk with clients. There are many ways to define risk in investing. One technical term is volatility, or standard deviation. I think that max drawdown, or downside risk, is a more applicable definition of risk for investors. The reason downside risk is important is the lopsided nature of the return required to recover from large losses. For example, you need an 11% gain to recover from a 10% loss, but you need a 43% gain to recover from a 30% loss. The math goes off the charts with a 50% drop, which requires a 100% return to recover to breakeven. This is the reason we spend so much time thinking about risk in addition to returns. Our goal is to create a smoother “rollercoaster ride” for client portfolios by limiting downside risk. In real life; however, I enjoy the rollercoasters with the biggest drops. • All expressions of opinion reflect the judgment of the authors as of the date of publication and are subject to change. It should not be regarded as a complete analysis of the subjects discussed. [i] Minutes of the Federal Reserve Open Market Committee; June 13-14, page 3.